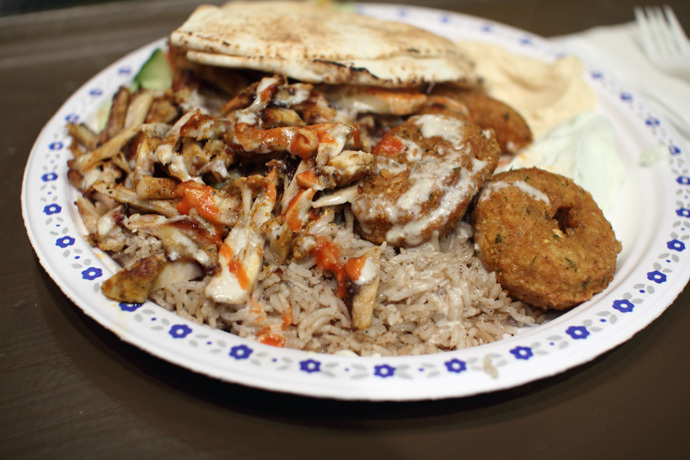 Aladdin’s Shawerma Cafe (map, 720 Robson Street, Vancouver, BC, Canada, phone: 778-881-7916) is a recent addition to the downtown Granville Street area, serving delicious and fresh Middle-Eastern fast food until the late hours of the evening. The small restaurant is brightly lit and clean, and they offer a selection of vegetarian falafel wraps, chicken Shawerma wraps, combination platters, and more! Most people order take out from here, but there are also some comfortable bar stools along the side counters which are perfect for a quick sit-down bite. While most items are around $5 to $6, their biggest platter – the Shawarma Falafel (pictured below) – is just over $10 and features the works: a salad, hummus, tatziki, rice, tender Shawerma chicken, and several tasty falafels. Hot sauce is optional but highly recommended! 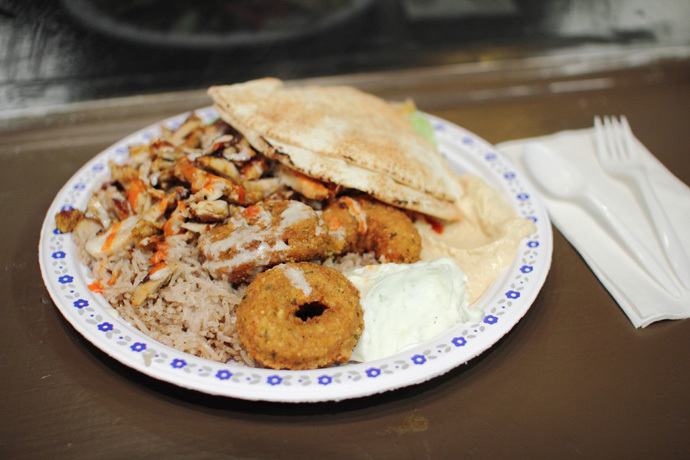 Falafel Shawerma platter from Aladdin Cafe in downtown Vancouver BC Canada. Close up of the chicken in the Middle-Eastern Chicken Shawerma Falafel platter from Aladdin Cafe. 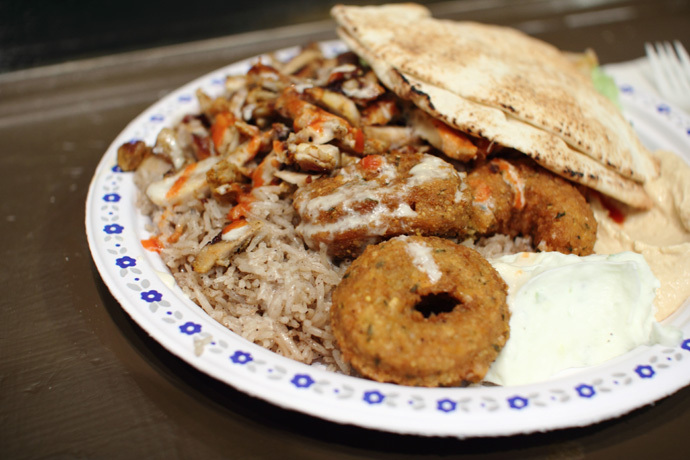 Another photo of the Chicken Shawerma Falafel platter from Aladdin restaurant on Robson Street, Vancouver. You are currently browsing the Dine Out Here Vancouver weblog archives for December, 2010.